An important part of taking care of your cat is making sure that it gets the best possible nutrition to maintain its good health. This is not possible by just giving it the food that we need- for the nutritional requirements of your cat are going to be different then what people like us need. Often, people chose cat food based whatever they hear in advertisements or from their peers, who may not be the BEST CAT FOOD ADVISOR out there. This is why you need to make a thorough analysis of what your cat needs and what is available through tools like THE BEST INTERACTIVE COMPARISON CHART (given ahead) to make the right decision. As mentioned, cats have different nutritional needs than humans, which makes having specialized cat food a necessity. While there are a variety of choices available in the market, it’s not all good for them. But before moving on to what’s available, it’s important to understand what needs to be checked before buying cat food, and that’s exactly what’s coming up ahead as the BEST CAT FOOD ADVISOR to help you make the right choice for your cat. When you go out to buy cat food, you’ll be surrounded with products that would employ marketing ploys in order to sell themselves, the most common ones being claims of their organic, natural or holistic nature. This is not something that cats require, unlike humans, for their nutritional needs are not similar to humans (just like we mentioned earlier). There are no specific ‘classes’ of cat food that you need to look out for- organic and natural aren’t exactly what they require in their diets. A healthy species-appropriate choice for your cat isn’t what the advert says, but is the one that would give it exactly what it would require. The most important thing to look out for in food is to make sure that it is rich in high-quality protein, which should be muscle meat and not parts and pieces. It should also have high levels of moisture along with EPA/DHA, along with not more than a moderate level of animal fat. Contrary to what we require, food for your cat should not have more than a few freshly cut fruits and vegetables (to mimic the contents of their prey’s stomach), and should have absolutely no potato wads, grains and any other ingredient with starch, since these are not really required by cats. A rule of thumb is to not use any cat food that has soy or corn, in any form, since corn is a known allergen and soy can destroy your pet’s endocrine system being an estrogenic. Any food that contains byproducts, and more importantly, those that do not mention which byproduct, need to be avoided at all costs since you could end up feeding your cat parts of feathers, feet, beaks and even tumors which have ground while preparing the mix. Thanks to all such ploys and efforts, we are ‘programmed’ to search for phrases and words such as ‘weight loss’, ‘low fat’, ‘good/organic source of something’ and so on. This is one of the biggest mistakes that you can make in choosing nutritionally appropriate food for your cat. Ignoring the labeling claims on the cat food being sold is the best thing that you can do. If not labeling claims, then what should you look out for while buying cat food? The answer is certification like that of AAFCO, which signifies that the food meets all basic requirements for trace minerals well as vitamins. Also, a longer ingredient list would also mean that there is a greater potential for making your pet full with biologically inappropriate- something that could also be toxic and/or allergenic. Be wary and pay close attention to what it contains. Now that you know what things you should look for and what you need to avoid while buying food for your cat, you’ll have to compare products to select the best ones. With interactive guides along with THE BEST INTERACTIVE COMPARISON CHART, you’ll understand what having the BEST CAT FOOD ADVISOR is like as you read ahead. Though petting a cat may sound simple, but you must be amazed to know that they completely rely on their owner. Therefore, it becomes vital to choose the best cat food for cats. But, how can you make the choice? There are innumerable brands and products available in the market which can literally confuse your buying decision. Choosing the right product is essential so that the actual purpose can be fulfilled. It is advisable not to fall into the trap of marketing gimmicks as they might not offer you the actual information. Checking out the reviews of different cat foods can be the best way to identify the right product. While making a choice of product, it is vital to check out the nutritional value. Offering balanced diet and nutrition to your cat are the sole responsibility of every pet owner. Clear understanding on the ingredients and quality can be obtained once you check reviews. It is highly recommended to feed your pet with food that contains vitamins and minerals. The complete cat food reviews can give you the best knowledge and idea about different food products available. It acts as the guiding star in your buying process. No matter for what reason you love your cat, they are known to be the best companion. While choosing advanced and right nutrition for cat, their lifestyle and age should be considered. 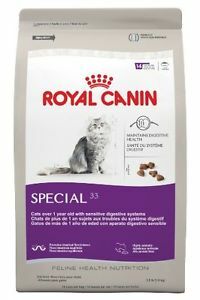 As a CAT FOOD ADVISOR, Royal Canin Special 33 is known to be an ideal food product that can easily fulfill all the nutritional needs of cats that are prone to sensitive digestion. Some cats suffer different digestive issues such as constipation, loose stool etc, therefore, it is necessary to add specially formulated food to their diet. This particular product helps to strengthen the digestive system of your pet. 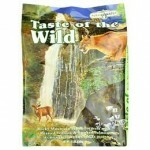 It is the most popular and recommended food product for the cats. A complete source of fiber can surely enhance the digestion by offering the complete nutritional value. Presence of Vitamin E, D3, B12 supplement and fermentable fibers help to develop good bacteria in the body. It is possible to satisfy feline appetite of the cat. Apart from introducing right food, it is necessary to serve them at the right time and in right quantity. 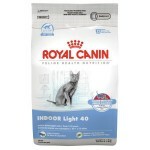 Royal Canin Indoor Adult 27 is also considered as the best food for cats and they have the potential to fulfill the specific nutritional requirement of indoor adult cats. 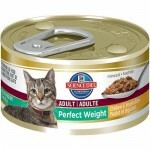 This food product is specially designed for the cat that falls in the age group of 1-10 years. If your cat is suffering from dental problem, odor and hairball, then it is the ideal product. Specialized nutrition is designed exclusively for indoor cats. Indoor cats are more prone to the problems like obesity, lack of energy etc. This is the reason why they need special attention. Proper adaptation of diet becomes necessary which can reduce the chances of hairball formation. The improved digestion can surely contribute to odor reduction. The availability of chicory extract helps in proper digestion. Proper fiber content encourages the intestinal transit. You will find that this product contains lower protein that can enable in lesser stool odor. Optimal calorie content can lead to the proper weight and no indigestion is experienced. 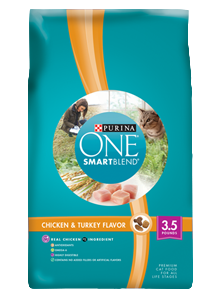 Switch to Purina ONE SmartBlend Cat food and see the difference! The product is a complete blend of nature and science that has emerged some of the key ingredients and nutrients. Each and every item work together and deliver best results. 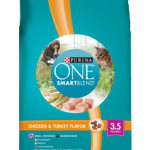 As a cat food advisor, it can be said that the use of real turkey in the product gives rise to antioxidants which is highly beneficial to the cat. In order to maintain healthy weight, proper nutrients and vitamins should be adopted. The natural fibres blend can minimize hairballs. Vitamin E and an along with mineral zinc and selenium make the food a complete diet. To support a stronger immune system, SMARTBLEND can be the ultimate choice. The food will work round the clock in your cat’s system and will deliver best results. Use of innovative formula can contribute in a healthy skin and coat shine. It can be a delicious meal for every cat. Lower in calories and the presence of real turkey can lead to healthy weight. Such product contains all the essential ingredients that can strengthen the bones and joints. 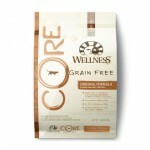 Here comes the most amazing grain-free food that can be served to your cat at any life stage. 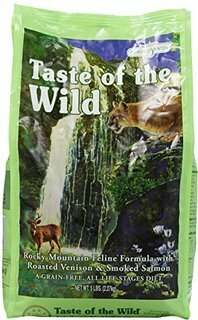 Taste of the Wild Dry cat food can surely satisfy the needs of the cat and can fulfill the nutritional value that is necessary in different life stages. Sweet potatoes, smoked salmon. Blueberries and roasted venison add to delightful taste of the food. 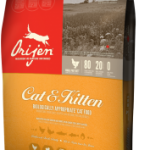 It can surely be considered as one of the best dry cat food. The wonderful flavor can truly fulfill the desire of your cat. The digestible energy, minerals and vitamins can contribute in the wellness of your pet. If you want to support the overall health, then it is necessary to include natural antioxidants and fatty acid to cat’s lifestyle. This product comes up with all the essential ingredients that can serve the best. Premium quality food can certainly support strong teeth and bones. Once you scrutinize the ingredients, you will come across with Taurine which helps to maintain the eyes and heart health of the cat. 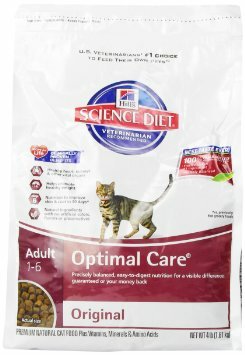 If you are looking for the highest quality product that contains natural ingredients, then Hill’s Science Diet Adult Optimal Care Original Dry Cat Food can be the only option. Once you add up the right nutrition in your pet’s life, the energy level and quality of life gets enhanced. Rich in nutrients and minerals can lead your pet with a healthy lifestyle. Chicken, whole grains and multi-vitamins can add up to the balanced diet. Visible difference is guaranteed to the pet owner. 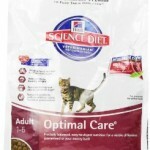 It is the appropriate diet for cats between 1-6 years. It is not necessary to add up the best wet cat food in the diet plan. Rather the introduction of dry cat food can help in easy digestion. A visible difference is experienced once you switch to this product. Taurine and amino acids can surely promote the healthy growth of organs that may include kidney and heart. 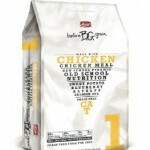 Real chicken is the natural ingredient available can promote healthy weight. Improving skin and coat within 30 days can also be the reason behind choosing this dry cat food. Is your cat having a sensitive stomach or dry skin? 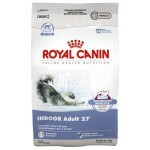 In such a case, you need to look for the best dry cat food that can help to resolve the issues. The unique formulation of the product helps the cat in proper digestion. 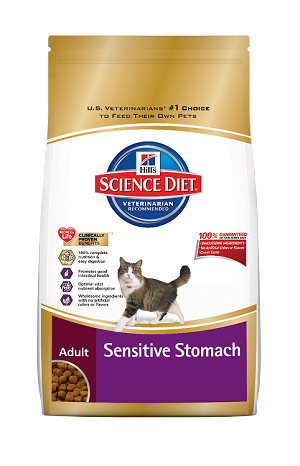 Dermal and digestive needs can be fulfilled and the pet can get the most of the food. It is highly recommended to adult cats who are suffering from sensitive stomach and skin. 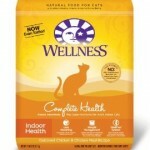 If your cat is pregnant or they are just the little kittens avoid using this food product. The unique formula helps the cat to fight against skin problems and upset stomach. 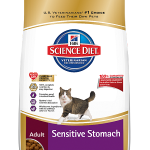 You can try today to give relief to your cat’s sensitive stomach! It contributes to 100% nutrition and helps in proper digestion. High quality ingredients and clinically proven antioxidants can contribute in the betterment of health. Proper intake of vitamin C, omega fatty acid can lead to healthy skin. Now, you can easily eliminate the dandruff, irritation and excess shedding from your cat’s life! 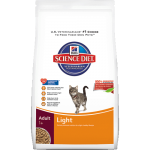 Hill’s Science Diet Sensitive Stomach and Skin Dry Cat Food are a complete blend of high quality protein and fiber that can ensure in proper nutrient absorption. To offer a fit and happy life to pet, it becomes vital to add premium quality food. Do you want to buy the best cat food that is low in carbohydrates? This product is high in meat protein whereas low in carbohydrates. Cats usually crave for raw meat and they would prefer it over grain if you give them an option. 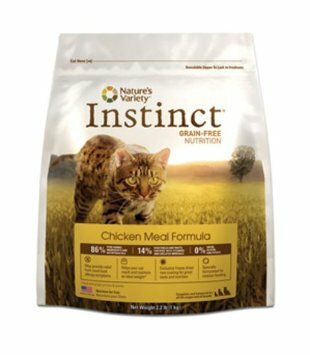 Nature’s Variety Instinct is a good source of animal protein and ensures consistent feline metabolism. Protein found in this product is actually obtained from meat which ensures high quality chicken and fish meal. The only reason to use this product is that it helps in better skin and coat, improve energy level and also strengthen teeth and gums. You will be surprised to know that fruits and vegetables are also included which act as a natural source of vitamins. Digestible tapioca is the other premium quality ingredients used. The only reason behind using finest quality food is to promote weight control and offer a longer life span to cats. It is a revolutionary food that does not contain grains and glutens. 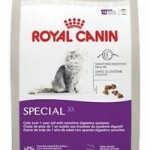 Cat food coupons are also available online through which you can make your purchase and get an additional discount. 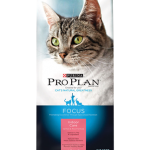 You can switch to this product at any life stage of your cat without affecting the health. Most of the pet owners are concerned about choosing the best puppy food. But, you should remember that both dogs and cats need special attention. Different digestive system urges for right food product that can help in proper digestion and lead to improved health. Foods are designed depending on the lifestyle of the cat. Therefore, it becomes vital for you to make the exact choice. Indoor cats have a different lifestyle as they get lots of love and affection from family members. So, it is important to ensure that they get unique nutritional benefits from the food consumed. 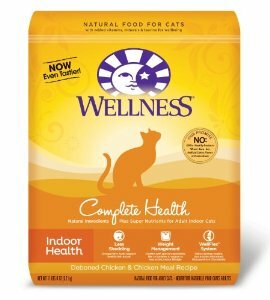 Wellness Complete Natural Health Dry food is specially designed for indoor cats. The unavailability of GMOs, wheat, corn and meat by-products have contributed to the success of the product. No artificial colors, preservatives and flavors are used in the product. Essential vitamins and minerals are available which even include triple cranberry blend. Cranberries contain phyto-nutrients that ensure overall well-being of cats. Presence of natural flavors has led to the most preferred product. Glucosamine and chondroitin are special ingredients that can help the cat to stay active. Delicious flavor has made the food completely irresistible among cats. 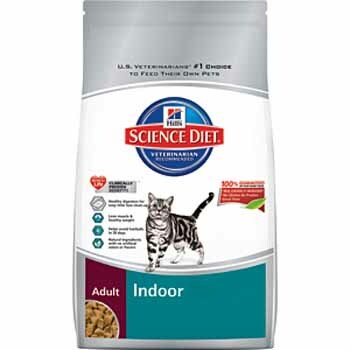 If you are focused on offering the balanced nutrition for your cat that is having an indoor lifestyle, then you need to opt for Hill’s Science Diet food. 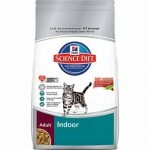 It is a known fact that pets leading an indoor life need to check their diet plan. The key nutrients are present in optimal amount that helps in having a balanced diet. 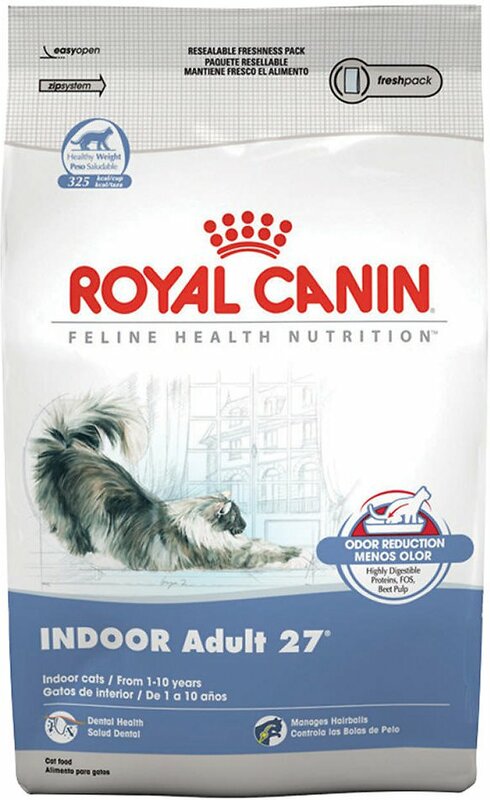 If you want to fulfill nutritional needs of cat, then this can be the ideal choice. 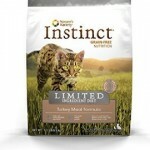 Such an amazing product is developed by adding 50 nutrients that are based on lifestyle and size of cats. The best cat food enables you to maintain a healthy weight. It is a clinically proven product that contains antioxidants and fiber which can boost up the immune system. Within 30 days, you can experience less hairball in your cat due to presence of fiber technology. Purity in ingredients is strictly maintained so that this product can exceed industry standards. 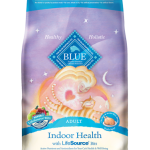 Such products are specifically tailored for indoor cats to strengthen their nutritional balanced diet. If you are truly concerned about your pet and want to offer a healthy lifestyle to them, then it becomes obvious to choose the right food product. Emergence of different brands and products can lead you to a wrong decision. Therefore, reading through reviews and having a clear understanding on each product can help you identify the right product. The cat food reviews can give you an idea of the quality and purity of products. Now, you can easily make the right choice and have true value of money.